Battenkill Brebis, made in Shushan, NY, is a sheep’s milk cheese made in the French Pyrenees tradition. The cheeses from the South of France have been made in this way for over four thousand years. The oldest known version is Roncal which comes from the Basque region in Northern Spain. 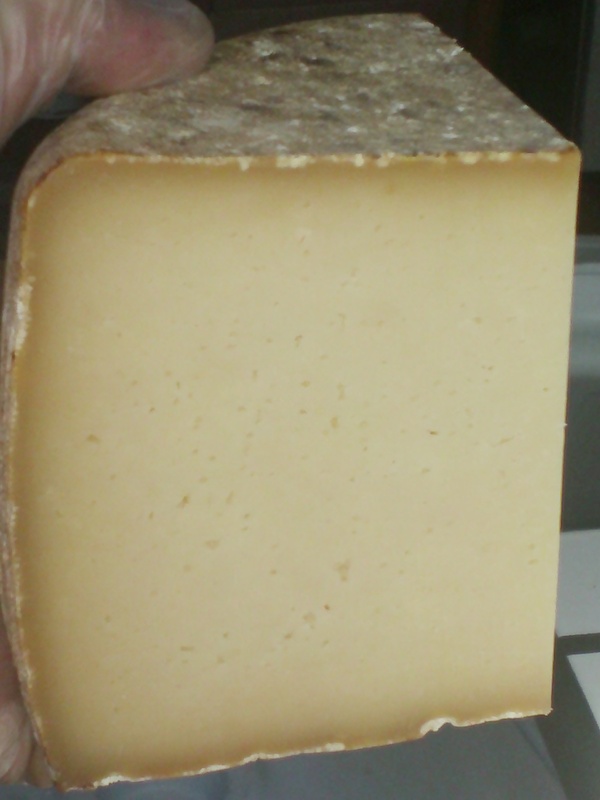 Battenkill Brebis, like the sheep’s milk, name controlled cheese Ossau-Iraty from the Pyrenees, has a slightly higher moisture content than Roncal. This style of cheesemaking became of interest to American cheesemakers after Vermont Shepherd, founded by Cindy and David Major began making perennial, award-winning cheese in 1990. They were the first U.S. cheesemakers to construct a natural cheese cave, which they built in the side of hill on their Vermont farm. They studied brebis cheese making in the Pyrenees among skilled cheesemakers and brought a grand tradition to the States. Many Vermont sheep’s milk cheesemakers apprenticed and produced cheese for VT Shepherd. This made them pioneers in the American cheesemaking business, educating cheesemakers and sustaining public interest in Pyrenees cheeses. Continuing in this American cheesemaking tradition, Karen Weinberg makes her award winning Battenkill Brebis and Frere Fumant (a smoked version). She has just released the first wheels of Battenkill Brebis of the year. This young version of the aged sheep’s milk cheese comes from the earliest milk of the Spring and is aged three months. The character will change throughout the year as the cheese ages longer and new wheels are made from milk of later pastures. These wheels have a rich texture because of the high butterfat content of sheep’s milk. The flavor profile is nutty with delicate notes of pasture “flora”—the wild grasses, herbs, and flowers of the Spring pasture (this flavor can change slightly throughout the year, depending on the perennials on which the animals graze). The cheesemaker, through the ripening process, harmonizes these natural flavors to create a good salt balance and a good tasting cheese. This cheese has been a recent winner at the American Cheese Society annual competition and featured as the Spring 2010 centerfold cheese in Culture Magazine. It is traditional to pair Pyrenees cheeses with locally produced cerise noir (black cherry) or fig preserves or a dark honey. It is also delicious with toasted nuts. A classic wine pairing is Madiran or Cahors (same grape as Malbec) which are both made in the Pyrenees region of France. Orloff, Paige Smith. “On the Make with Battenkill Brebis” Culture Magazine. Spring 2010, 56. Roberts, Jeffrey P. The Atlas of American Artisan Cheese. Vermont: Chelsea Green Publishing Co., 2007. This entry was posted in Spotlight on Cheese and tagged cheesemaking, farmstead, French, new york, pairing, Pyrenees, sheep's milk cheese by The Cheese Traveler. Bookmark the permalink.